Unless you’ve been living under a rock, you undoubtedly are aware of the recent uprising of ISIS, aka ISIL, aka the Islamic State. This group of Islamic jihadis have been rampaging across Syria and Iraq, taking territory and killing infidels along the way. Clearly, these actions are condemnable. In fact, I believe that goes without saying. After the alleged beheading of journalist James Foley by “Jihadi John” of the Islamic State, the mainstream media and usual war-hawks have been calling for blood. They’re ramping up the rhetoric of yet ANOTHER war; this time, against the Islamic State. If you’re like me, you get suspicious whenever you see a narrative like this in the MSM. Before we get into this, something must be clarified: our government has no way of distinguishing between these Islamic groups that are fighting in Syria and Iraq. But what we do know, is that they’re all factions or splinters of Al Qaeda. It also seems as if these groups have recently unified under the “Caliphate” known as the Islamic State. And the reason we should all be suspicious, is that if you recall correctly, it wasn’t that long ago that the US government was touting aid for Islamic “freedom fighters” that were battling Assad in Syria. As a matter of fact, we know that our government has been arming them since at least September of 2013. At that time, the liberal media outlet Washington Post confirmed that the CIA had been delivering weapons, munitions, advanced communications equipment, and armored vehicles to these Islamic fighters. But even this wasn’t enough. President Obama has since requested more than $500 million in funds to assist these jihadis! The weapons, gear, and money sent to these “freedom fighters” undoubtedly ended up in the hands of the Islamic State; the same group our government and media are now insisting we go to war with! So basically, we built up an enemy fighting force, and are now attempting to fight them ourselves! Yes, I know, this seems odd. And counter-productive. But it really makes sense when you consider that war is very profitable if you happen to possess a defense contract, or happen to know the right people in DC. Further, the government loves using war and threats of attack as an excuse to consolidate their power and to steal our civil liberties. The most recent examples would be the PATRIOT Act and the TSA, which were knee-jerk reactions to 9/11 and Al Qaeda. Civil War: I could do a whole article on the Civil War and Lincoln’s tyrannical, unconstitutional actions including trying civilians in military tribunals, but I will stick with the point here. The Civil War could most definitely have been avoided. You must consider that slavery was not a central tenet of the Civil War, as far as Lincoln was concerned. Lincoln was not a fan of the black race. He argued that, even if the slaves were freed, they should be shipped off to Liberia. The slaves could’ve been emancipated via compensation by the government. The “value” of the slaves was approximately $70-80 billion. Lincoln ended up spending $76 billion enforcing the Civil War. So essentially, he could’ve just paid to free the slaves, and saved 100,000 lives. The Civil War was really about the South’s struggle for states’ rights. The South rightfully viewed Lincoln as a tyrant that did not respect the rights of the states. The states, at that point, were still considered sovereign, and the federal government was small and had little influence throughout the country. The South argued their right to secede from the federation. And they should’ve been able to. The states entered into the federation voluntarily, and thus they should’ve been allowed to leave the federation voluntarily. WWI: Prior to American intervention, there had been a three year stalemate in the Great War, and both sides were discussing truce plans. The war would’ve ended soon. But no, Wilson just had to have his hand in the “rebuilding” of Europe. And his League of Nations could not come to fruition without major American intervention in the Great War. Wilson said that had America not entered the war, he wouldn’t have even had a “peep through the curtain” of the Treat of Versailles. Without American intervention, the Great War would’ve most likely ended in a truce, and the involved European countries would have maintained their original land borders. The Treaty of Versailles would’ve never happened. Woodrow Wilson was reelected in 1916 by running on the slogan “He Kept Us Out of War.” So how did he convince the American people to join the war? He allowed American citizens to die in the sinking of the Lusitania. I say “allowed”, because it was completely preventable. While Germany was at war with Great Britain, they warned the American public about taking voyages on British ships, as many trans-Atlantic voyages were carrying military aid for Britain. 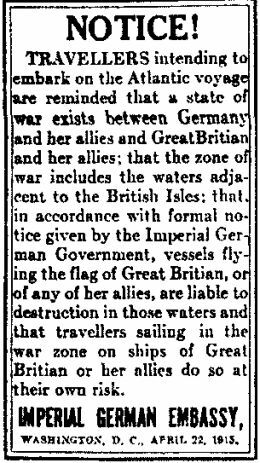 The Germans issued publications and advertisements in America, warning Americans to stay off of British ships. But Woodrow Wilson knew that an event that resulted in the deaths of a large number of Americans could be propagandized and used to warm the American public towards entering the war. So Wilson encouraged Americans to continue sailing on British ships. In fact, when the Lusitania, which was designated as an auxiliary British war ship, was sunk by Germany, they were carrying 4.2 million rounds of ammunition, as well as explosive components. Wilson’s plan worked; after 128 Americans died on the Lusitania, the government sold their war to the American people.